Back in the early 80's as a child, there was nothing cooler than breaking open an old Simon game or other toy with a circuit board. The maze of components in different shapes and sizes arranged down multiple connection points always evoked similarities to the look of a small city from the future. It's influences from childhood like this that inspire some of the best custom wall murals that you're bound to love for aesthetic as well as nostalgic reasons. We think circuit boards are beautiful; they're often quite colorful and compositionally have many interesting features, repetition, pattern and balance. 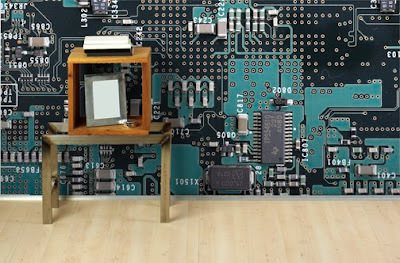 The circuit board custom wallpaper that we're featuring in the inspiration room has strong teal and navy blue colors present. The wall mural gets a lot of visual interest from all the components scattered around the board; all of the circular elements are particularly effective at giving the wallpaper an engaging look. This custom wallpaper project is perfect for those technologically inclined. If you've ever made disassembling machines a hobby or have ever been called a "nerd", this custom wall mural is the perfect way to wear your advanced understanding of electronics on your sleeve, all the while looking like a trend setter in the process. If designers and stylists are those who typically inform interior decor trends, this is the mural that will definitely appeal to those more left-brained individuals who aren't afraid to let the right side shine.